Four Seasons ~ Yours to Enjoy! Yes, you heard me right; I love Canadian winters. It’s part of who we are, it brings us together and it creates for some friendly competition between provinces. I mean, it’s practically a Canadian pastime to talk about the weather where you live, am I right? It’s the time of year when the hustle and bustle of a city is dampened after a snowfall, when cheeks are permanently flushed and when everything outside suddenly turns into a white, sparkly, winter wonderland. It’s also the season when, after a day spent outside, I get to curl up in all my layers and finally have an excuse to wear the oversized sweater I stole from my dad. 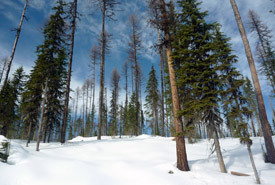 With the first major snowfall come and gone in many Canadian cities, I figured it was time to stoke the fire and get writing to the winter avoiders out there. So, before you pack your bags and head south, hear me out. Below are my top five winter essentials. This list definitely doesn’t capture them all, and is meant to supplement your regular cold weather attire. I’ve also listed my top five outdoor winter activities that require little to no experience and that are budget-friendly! I’ll be the first to admit that downhill skiing is one of my favourite winter pastimes, but there is something to be said for those simpler activities that you can experience with pretty much anyone and that won’t break the bank. This is an absolute must. Anyone who knows me, knows that I own enough toques for every day of the week, but I assure you that a good toque will make a huge difference in preventing heat loss through your head, and keeping your ears warm. There are so many varieties of toques out there, you’re bound to find one that suits your style. Blistex is my personal favourite, but there are many options to choose from. Despite growing up in the dry, Alberta cold, my skin and lips have never gotten used to it. Don’t forget that just because it’s cold, it doesn’t mean that the sun’s rays stop being harmful! It’s a known fact that noses run when it’s cold outside. It’s always good to be prepared, and carrying tissues is a great way to prevent any embarrassing situations. We put winter tires on our cars, so why wouldn’t we do the same for our feet? Having waterproof, grippy, insulated boots means you can walk those winter streets with ease and keep yourself safe and warm this winter. Check out this website for ideas on which winter boot is right for you. This is a great way to connect with fellow bird enthusiasts, and is a chance to contribute to one of the world’s largest sets of wildlife survey data. Christmas Bird Counts are North America’s longest-running citizen science projects. Find one near you this winter! 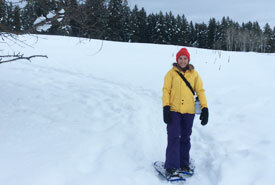 If you can walk, you can snowshoe. You can find a pair of snowshoes at your local outdoor provider for a fairly reasonable price, or rent a pair from most outdoor centres, such as your local university’s recreation centre. The nice part about this activity is that you often don’t need to go far to try them out. As long as enough snow has accumulated, your local urban park makes a great snowshoeing location. My brother, Ben, reminded me the other day how rewarding it is to lend your shovelling services to others. Last week, he took his little brother from Big Brothers, Big Sisters around the neighbourhood to meet the neighbours and offered to shovel their walkway. Before they knew it, Ben and his little brother had made $45 (without even asking for it! ), gained two Cineplex tickets, five bags of chips and — most importantly — made 10 new connections in the neighbourhood. 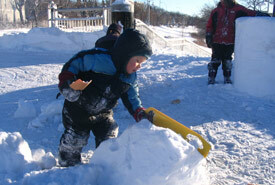 Ben’s little brother had so much fun, he asked to do it again next snowfall. There’s nothing cozier than sitting around a fire, but who says it can’t be done outdoors? Bundle up and get a bonfire going outside! This is the perfect opportunity to roast marshmallows, drink hot chocolate and cuddle up to a loved one while singing songs. There you have it — my tips for ensuring an enjoyable winter. In some parts of Canada, spring won’t return for another six months, so get out there and make the most of the season!